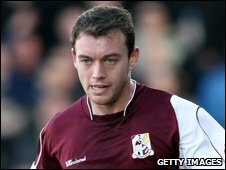 Blue Square Premier side AFC Wimbledon have signed former Brentford defender Brett Johnson. The former Northampton and Aldershot man, 24, left Griffin Park in May after making 12 appearances for the League Two champions last season. Manager Terry Brown told the club's website: "I am delighted that we've signed a player of Brett's ability. "He is a left-sided centre back who can cover as a left-back if needed. He's a player with lots of talent and pace." Johnson, who also has non-league experience with the likes of Ashford Town, Ebbsfleet United and Grays, added: "I've played for Terry before at Aldershot and I'm pleased to be re-joining him at Wimbledon. "Now that this is all sorted, I can't wait for the season to get started."